Rural Minnesota is losing it’s voice. That’s the conclusion of a study where researchers talked to 50 prominent Minnesota decision makers and surveyed 120+ more. Due to a combination of reasons, the state’s rural population is becoming increasingly left out and left behind on the discussions that affect our everyday lives. 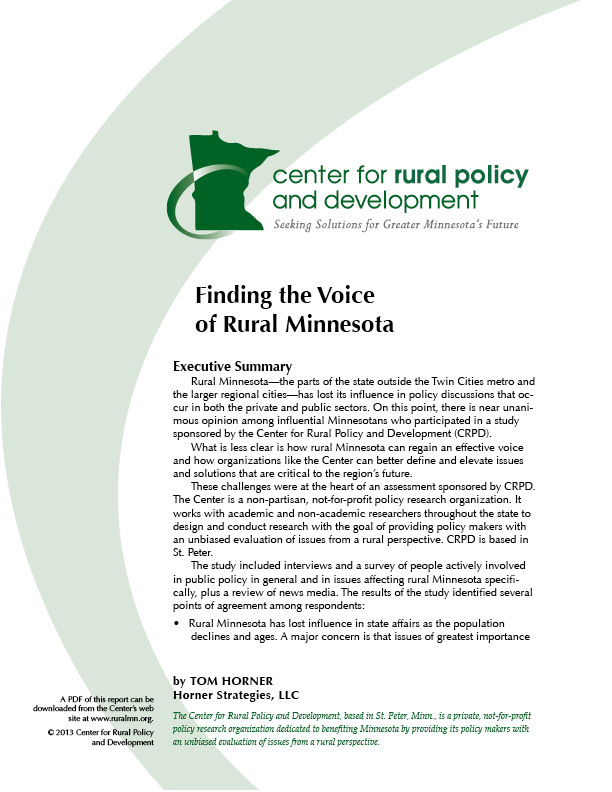 Finding the Voice of Rural Minnesota is part of a larger study the Center commissioned to assess our communications strategy. The information Horner Strategies collected from decision makers around the state, however, was so interesting—and potentially empowering—we decided to release it as a report. Read on to find out what people are saying and how they think rural can get it’s voice back. We value your feedback.